We’ve gone on and on about the merits of Flowboard, a web-based platform that lets users easily create media-rich stories or presentations and publish them onto its servers. Until now, the service has only been available as an iOS app — but that’s about to change, as a Flowboard authoring app hits the Mac this spring. 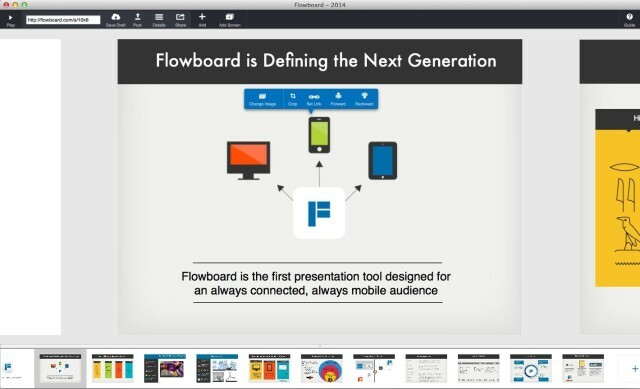 “We think this will open it up to typical Mac users,” Brent Brookler, Flowboard’s CEO and founder, told us when we sat down for a quick demo at the Consumer Electronics Show in Las Vegas a few weeks ago. Up to this point Flowboard’s adoption rate has been highest in schools, a trend Brent attributes to the app’s availability being limited to iPads. The new Mac app will incorporate live thumbnail previews, the ability to work offline, what Brent calls “one-hundred percent sync” and, like the web-based Flowboard viewer, will work with the Leap Motion Controller. Another big upcoming feature that should make Flowboard much more popular: Brent says Flowboard users will soon have the ability to export and import PDFs — possibly a soon as the next big iOS update, due out next month. Though the iOS app is free (with some premium features, like extra storage space, available with a $5 monthly subscription), expect to pay around $10 for the Mac version when it hits the Mac App Store.